Currently browsing articles with a topic of "salinity". 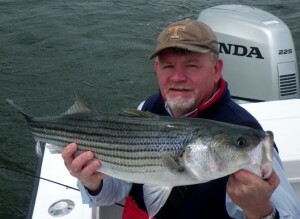 We’ve enjoyed a pretty good spring of light-tackle fishing on the Chesapeake Bay. Water temperatures warmed early, then leveled off through the end of April into May. Top-water casting is good right now at some places. 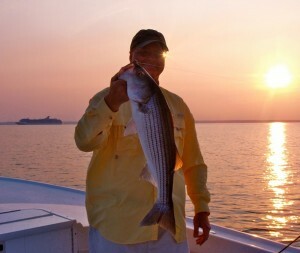 Some anglers are even sight-casting surface lures and flies to cruising fish on shallow oyster bars near the mouths of the rivers. The water in some parts of the Upper Bay is clearer than I’ve ever seen it. While that makes surface fishing enjoyable, it also makes jigging tough since it’s easier for stripers to distinguish the difference between our lures and baitfish. The clear water looks nice, but there’s a big problem lurking below the surface: Low dissolved oxygen (DO). Measured in milligrams per litre, dissolved oxygen levels were recorded at 1.04 on the bottom beneath the Bay Bridge in April. That’s lower than they’ve been in twenty-five years. Look out for big algae blooms coming soon. Salinity also peaked to record levels in April. Last spring, Bay Bridge salinity was 4.20 ppt. This year, it’s more than twice that at 10.50 ppt. DO levels are also low in Eastern Bay, although salinity there is closer to normal. What does this mean for the fishing? Read More! 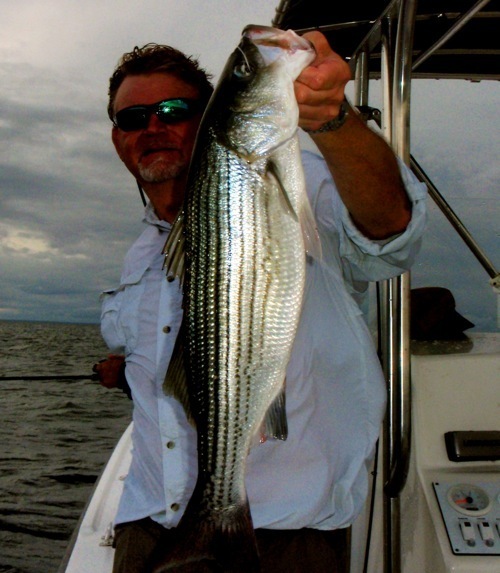 So far, it’s been a disappointing fall for Chesapeake Bay striper fishing. There are a few fish to be caught, but it usually takes a lot of time and fuel dollars to find them. I spent a few minutes last night going over my logs from the past four years. This November’s fishing has been the poorest I’ve seen since I started fishing the Chesapeake. I think there are several reasons, first and foremost is lack of bait. We already know that menhaden have been over-harvested to the point where they are only a small fraction of what they should be, and we know that striped bass populations are down, but I think our biggest problem this fall is fresh water. Last week, the Maryland Department of Natural Resources reported big problems with Upper Bay oysters. As part of a Bay-wide survey, biologists collected samples from 15 individual oyster bars north of the Bay Bridge. In the four northernmost bars along the Eastern Shore, oysters suffered a cumulative mortality of 79 percent, with no live oysters on the two northernmost bars. The few live oysters that were found in upper Bay bars were in poor condition — bloated, watery and translucent — and mortalities may continue for some time. Biologists believe the high mortality was caused by the lack of salinity in the upper Bay from March through July, 2011. During that period many modern day records were broken for high flow and low salinity. Read More! I recently found some old pictures of myself in diapers, standing beside a small wooden boat parked in front of a Tennessee farmhouse. Towering above me was my father, and at my bare feet was a nice stringer of fat largemouth bass. Did I catch them? Probably not, but like any good fisherman, I’ll happily take the credit. I might even tell you a tall tale about how – at the ripe old age of two – I tricked them into biting a lure that I hand carved from a boar’s tusk with a Bowie knife, and how they pulled harder than a Smoky Mountain mule. There’s no doubt that I owe much of what I know about fishing to my father. There’s nothing better than fishing with family. All three of my sons have become first-class fishermen. This week I’ve been fishing with my family’s next generation of anglers. 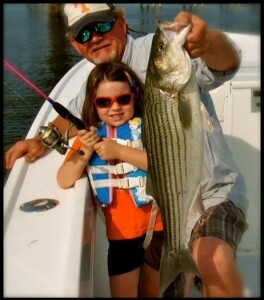 I’ve had a great time on the water with my son Daniel and my granddaughter Ella. I’m happy to report that Chesapeake Bay salinity levels are finally climbing back toward normal levels (see chart below), although they’re still low. Since conditions are stablizing, striped bass fishing is getting a little more reliable. That isn’t to say some days aren’t better than others, but we’re at the point where I at least think we can count on a few fish on any given outing. Fishermen have long recognized the importance of locating comfort zones where fish prefer to stay, but sometimes that isn’t so easy. 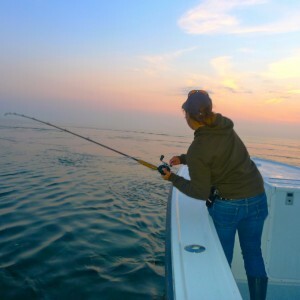 Fishing in late May and early June is usually a challenge, but low salinity levels have made it especially difficult this year. Complicating the matter is that he water can be a lot saltier on the bottom of the Bay than it is on top this time of year. Since, in addition to surface observations, The Gooses Reef Buoy also provides salinity readings from the bottom of the Bay, we can see that it’s currently 7.1 ppt. That’s over three times saltier than it is on the surface. Read More! If you’ve looked down at the water flowing beneath the Chesapeake Bay Bridge recently you’ve surely noticed that it’s the color of butterscotch syrup. According to the Maryland Department of Natural Resources, the flow over the Conowingo Dam on March 12 was the highest since Tropical Storm Ivan in 2004. Water clarity is worse than it’s been in recorded history. We’re currently experiencing an annual event called the freshet. Although I never heard the term before I moved to this region, I now know that a freshet occurs in saltwater estuaries when spring rains and snow-melt cause upstream rivers to flood. This results in the additional flow of hundreds of billions of gallons of muddy, sediment-saturated water into the Bay. The map on the left is a NASA satellite photo of the Chesapeake region taken this week. I’ve labeled a few places for reference. 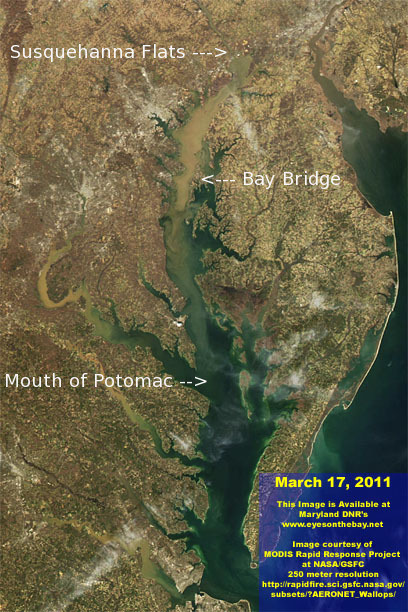 It shows a plume of muddy water flowing from the Susquehanna River south though the main stem of the Bay to the mouth of the Potomac River. Note that the water is muddiest in the area between the Susquehanna Flats and the Bay Bridge. Although the freshet occurs every spring, there is more flow in some years than others. During an average year, about two and a half billion pounds of sediment wash down the Susquehanna into the Bay. In very wet years it can be twice that. It remains to be seen how this spring will turn out, but for now things are above normal. Since there is research proving striped bass spawn more productively in fresher water, the news is both good and bad for fishing. Read More!